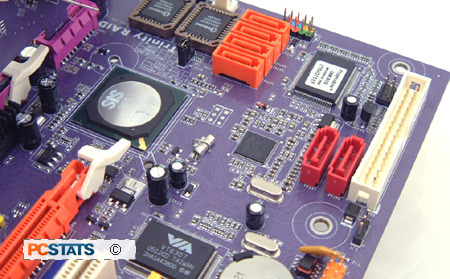 The ECS PF88 Extreme Hybrid motherboard is certainly colourful, but the labelling job on the board is mediocre, so keep the users manual handy when installing it. The PF88 Extreme is pretty big at 30 x 24.5 cm and mounts onto the case via nine holes. The physical layout of the motherboard's components is pretty good; for example the location of the 24 pin ATX power connectors and the IDE connectors are just perfect. The bottom right hand corner of the motherboard is quite busy, but ECS designers have done a generally good job at placing things. The Silicon Image Sil3132 Serial ATA II RAID controller gives end-users a lot of flexibility. Running on a PCI Express x1 connection, the Sil3132 natively supports two Serial ATA II devices but with the Port Multiplier function, you can hook up almost an unlimited number of HDDs! With the use of a port multiplier, the Sil3132 is capable of running RAID modes 0,1,5 and 10, albeit in software mode. Don't let the small heatsink on the SiS 656 fool you; the Northbridge generates a lot of heat and you'd better have good airflow in your case. We were a bit surprised to see that the SiS 965 Southbridge chip didn't also have a heatsink on top as it runs too hot to touch. If you are uncomfortable with this, there are two mounting holes available which allow you to add a standard chipset heatsink. 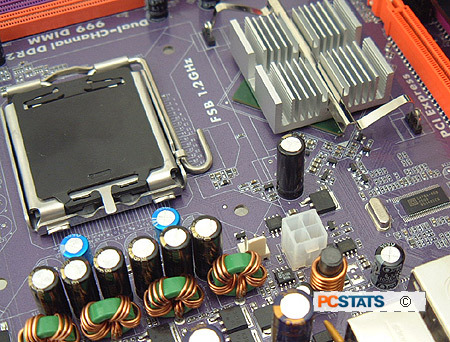 The motherboard has a ATX 2.0 24 pin power connector on the top right hand corner, but the PF88 Extreme is also compatible with older 20 pin ATX power supplies. Please note that if you do use an older power supply, it must still have the separate ATX12V connector. ECS only equips the PF88 Extreme Hybrid with one PCI Express x1 slot. If you do need to install another expansion card, there are three traditional PCI slots available. I was happy to see that ECS equips the PF88 Extreme Hybrid motherboard with dual BIOSes. This will certainly give end users peace of mind when updating the motherboard firmware. The user's manual is quite well written and should be able to guide novice users around the board. The software suite that's included with the motherboard is adequate, and even counted among its titles a full copy of the WinDVD Cinema software. If you got the A/V bug you'll enjoy playing with that. There's a bit of confusion on Pentium 4 support, according to ECS the PF88 Extreme supports 1066 MHz Pentium D and Extreme Edition processors... but the official SiS 656 chipset website says differently. We'll have to side with SiS on this one since we do not have a 1066 MHz processor to test the board with at the moment.